Palace View is an exclusive development set beside the magnificent Lambeth Palace, steeped in iconic London history. It is home to 55 beautifully finished apartments with unrivalled views of Parliament, Westminster and the River Thames. The buildings’ bespoke interiors have been designed by award-winning design practice, Farrells, and reflect the unique location and high-quality architecture. Prices from £1,225,000 to £2,175,000. For a limited period only, selected apartments at Palace View are available with an exclusive 6% Net 2 Year Rental Guarantee*. The bespoke tailored service includes two years’ ground rent, service charges and lettings fees, a furnishing package by an expert interior designer, fully managed lettings and a contribution to legal fees. *T&C's Apply. Contact the sales team for full details. 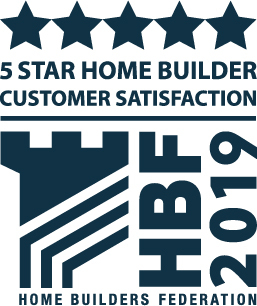 We’re proud to have been awarded the maximum five stars in the HBF 2019 Survey, which means that 90% or more of our customers would recommend us to a friend. Find out more about this exclusive boutique development in a historic location. All prices are correct at time of broadcast and can change without notice. All apartments are leasehold properties. Please speak to the Sales Team for further information. Please refer to the disclaimer here. London proudly stakes its claim as the best-loved city on the planet, and rightly so. A unique combination of the old and the new, this is the place where iconic royal palaces sit side by side with contemporary art galleries. A nourishing financial command centre, major fashion capital, and food lovers’ paradise, London also produces some of the world’s most outstanding architecture, art and theatre, and is home to a host of prestigious schools and universities. Palace View’s central location makes it ideally placed to access the many esteemed institutions providing a world-class education and to some of London’s most iconic landmarks such as The London Eye and the Houses of Parliament. Palace View’s proximity to major transport hubs, including Vauxhall just 0.7 miles away and Lambeth North for the Bakerloo line only 0.5 miles from your door means the rest of London can be accessed in minutes. All of London’s major airports are an easy journey taking less than one hour.